Mumbai is referred to as the financial and business capital of India, accounting for more than 6% of India’s economy. It ranked among world’s top 30 cities by GDP, 4th fastest growing Asian city (by GDP growth in the period up to 2021 – Oxford Economics) and it accounts for 40% of India’s foreign trade. Despite Mumbai’s success, over the years its growth has been severely constrained due to characteristic challenges faced by big cities across the globe. This is where Palava steps into picture. With 20 sq. km of land, strategically located in the heart of Mumbai Metropolitan Region’s growth corridor, Palava is designed to grow intelligently, systematically and become a true model for “work-live-learn-play” development. 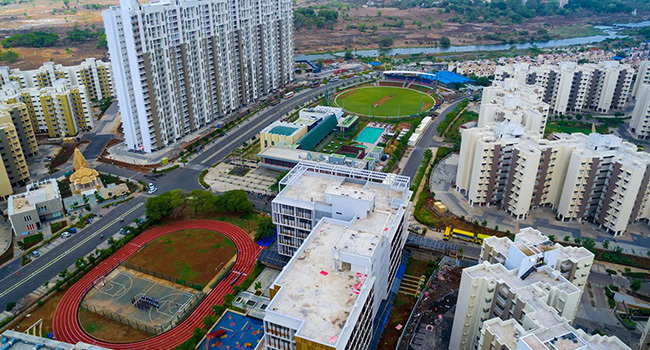 The city is already bustling with opportunities and is home to over 100,000 people, making Palava India’s fastest growing city. Over US$ 2 billion has already been invested into developing the city. And that’s just the beginning. Palava is envisioned to have an economy of over 10 billion US$ by 2025, which will provide up to 100000 jobs. As a green field city, every inch of Palava has been designed to make the setting-up and running of businesses more seamless and economical than ever before. There’s no place in India that’s more geared up to take businesses to the next level, while keeping employees happy and productive. The city is designed for Lowest Operating cost and businesses will benefit from lower direct costs driven by Savings in rentals, lower electrical tariffs compared to commercial rates, low Property tax. Palava removes the hassle from setting up and operating businesses with its unique ‘Just Ask’ service – a single window that helps businesses obtain all setup related permits and permissions. The city is managed by the ultra-efficient Palava City Management Association (PCMA), a private governing body that ensures Palava is run to international standards with an alignment to growing businesses and their productivity. Palava’s world-class infrastructure was conceived by global experts Sasaki and Buro Happold. 24 x 7 power availability with Express Feeders, abundant water availability, Fibre Optic high-speed internet, Well shaded 3.5m wide footpaths, Round-the-clock patrolling with private security etc. ensure employees and visitors get the best infrastructure to operate in and benefit from. Palava also boasts of readily available pool of over 250,000 professionals at the lowest cost in the Mumbai Metropolitan Region. With its walk-to-work ecosystem, businesses will have healthier, productive employees that are easier to retain. Palava is India’s first ‘green mobility’ city that’s designed for sustainability. Intelligent city design places everything you need – workplaces, schools, and parks – at just a 5 to 15 minute walk away. One will never need a car within the city- saving commuting costs, minimising travel time, and improving citizens’ quality of life. Knowledge/Skill intensive service industries: An office district with sustainable buildings and collaborative workspaces, markedly different from the undifferentiated mass of India’s back offices, will attract the best companies from the Advanced IT, ITeS, back-office, BFSI, Pharma, Media and other similar industries. Our incubator will also provide the right building blocks for start-ups and early stage companies. Logistics & non-polluting manufacturing: Palava’s manufacturing and logistics hub is the ideal location for logistics and value-added industries, with 24x7 power and water supply and excellent connectivity to the upcoming international airport and the JNPT port. Higher Education: The research and education hub is being designed to develop talent in much needed 21st century technologies like AI, automation, big data and VR Medical Services and Pharma: The medical city will cater to domestic and international patients with a world-class tertiary care facility and a hub for private medical practices. Entertainment and Tourism: Palava will be an entertainment and tourism destination with a focus on family entertainment, retail, museums and cultural venues. Palava has embarked on the journey to build a thriving economy - one that will offer a true ‘Work-Live-Learn-Play’ environment delivering world class work and living solutions for the first time in India and is on way to truly establish itself as the gateway to tapping into Mumbai’s massive economic opportunities.